Where the Indian subcontinent meets the warm Arabian Sea, nestled subtly between the relative behemoth states of Maharashtra to the north and Karnataka to the south and east, you’ll find India’s gorgeously laid-back, sometimes a little cheeky, and utterly fascinating smallest state: Goa. It is a meeting place in so many more ways than mere geography. It is where the western ways and architecture of the Portuguese and British have fused with everyday Indian life; where history and ancient culture is melded with modern traditions such as meeting for sundowners on the sand; where generations-old recipes are transformed into on-trend eats and world-famous dishes; and where its famed coastline of beach upon beach forms a golden thread, tying it all together. How many perfect sunsets can you get? The irresistible scent of spices (and subsequent riches) lured the Portuguese across the seas around 1500AD, leading to an astonishing 450-odd years of colonisation under Portuguese rule, interrupted only by brief British occupation from 1799 to 1813, and only finally ended in 1961. During the height of Portuguese influence, Goa would have more closely resembled Lisbon, or perhaps Brazil or Macau, than it would its Indian sisters Mumbai or Delhi. 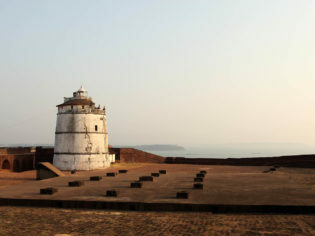 Now that Goa is safe back in the arms of Mother India, its European personality has blended quite uniquely with the countless other influences that have been thrown into this fabulous cultural crossroads. In any day, you might tour the 15th-century Basilica of Bom Jesus (housing the remains of St Francis Xavier, no less), munch on the local bhali-pau (bread roll and curry), shop a hippie market in Anjuna and then dance the night away in what is rated the sixth-best nightlife capital of the world. Don’t miss a heritage walk of the charming Latin Quarter of Fontainhas, and a visit to the state’s oldest fort at remarkable Reis Magos. Every kilometre of Goan coastline meets the sea in spectacular fashion, with almost entirely uninterrupted beach in many sections. This article may tell you about Goa three ways, but the truth is, Goa interprets beach life about a thousand ways: whether you’re looking for a weathered hammock under a palm tree or perfectly swept sands fronting five stars of resort luxury, you’ll find it in (beach) spades. Spiritual seekers come for the sunrise yoga and meditation retreats; Insta-influencers adore the perfection of the beachside bungalows of Turtle Hill, or Brangelina’s favourite flop at Elsewhere in Mandrem; history buffs fall in love with the wonderfully preserved treasures of Ponda and Old Goa, the inspiring temples and mosques such as Mangeshi Temple and 450-year-old Shri Mangesh, Bollywood-famous Chapora Fort and the must-see Fort Aguada, and stay in the opulently converted fort at Fort Tiracol. But then everyone seems to end up, sooner or later, on the beaches themselves. The ‘queen of beaches’, Calangute Beach, is an endless parade of watersports, shopping, eateries, and unbeatable people-watching. Baga Beach is similarly non-stop, while Anjuna Beach adds a hippie vibe and some particularly sensational market shopping. For the perfect quiet, tucked-away oasis of your dreams, try Ashwem or Arossim beaches – the latter has a couple of beach shacks with cold beer, great seafood and killer views as you watch the sun sink into the waves. Go on, dip your toes in! Forget everything you think you know about Indian food and fall in love all over again with the gastronomic marvels of Goa. It was spices that made Goa the mixing pot it is today, and it’s spices that manage to bring together Indian ingredients with Portuguese traditions, Catholic cuisines with Hindi necessities, and make it all sing. Fish and seafood are everywhere, befitting this coastal location and also pleasing both Hindi and Catholic sensibilities. However, the Portuguese wine that has flavoured their own cuisine for centuries has morphed into more sensible options here in India, with fermented coconut toddy (vinegar), Portuguese acrid lime, peppercorns and the southern Indian staple, tamarind, all adding a very particular tartness and depth of flavour in its place. You’ll also find a range of local sausage specialties, and a delicious obsession with cashews and cashew paste flavouring local dishes from corner holes-in-the-wall through to five-star kitchens. For top-shelf, occasion dining, the global-but-exotic menu at Go With the Flow in Baga is always a solid recommend, or pour on the Portuguese charm at The Verandah, Alfama or Nostalgia. On the other hand, put at least a mealtime or more aside to experience the famous Goan fish thali served at most beach shacks up and down the coastline. Follow the crowds to the best ones – they always know. Australians can now apply for an e-Visa for India, meaning you’ll no longer have to hand over your passport at an embassy, if you are eligible. To apply, head to indianvisaonline.gov.in (and beware of third party websites).